The next category of 2017 films I’ll mention are ‘Superhero Movies.’ Though several of these films feature actual comic book superheroes, I’m using the phrase more broadly to include any movie about people (or apes) with extraordinary abilities. First, a few movies I have yet to see: John Wick 2, in which Keanu Reeves kills the few people on Earth he failed to kill in the first John Wick; Atomic Blonde, in which Charlize Theron channels her inner Keanu Reeves (or maybe he’s been channeling his inner Charlize Theron); Pirates of the Caribbean: Dead Men Tell No Tales, which I’ll eventually see because I love my daughter; and Good Time, which probably doesn’t fit in this category at all but deserves a mention somewhere so this will have to do. I’ve been a Star Wars geek since I was five years old, when the original film made movie history and kicked off a series that, like a Jedi master struck down by an enemy’s lightsaber, has only grown more powerful over time. It’s easy to say I’m in the tank for these films despite their flaws, but that’s not exactly true when you consider the prequels George Lucas released between 1999-2005. In my late 20s, following a 16-year gap after the beloved original trilogy, I was poised to love that next chapter in Star Wars lore. But those movies all pretty much sucked. So much so that I watched each of them in the theater, with increasing disillusionment, and have never watched any of them again. So when J.J. Abrams took the mantle in 2015 with The Force Awakens, the Star Wars franchise was batting only .500. Fortunately his vision, as you might expect given that he grew up (like me) on the original trilogy, recalled the spirit and quality of those films. Now writer-director Rian Johnson (Brick, Looper) has taken the helm of the middle chapter in the new trilogy and delivered the best Star Wars film since 1980’s The Empire Strikes Back. Like Empire, The Last Jedi (#3 on my 2017 list) is a darker and riskier film than its predecessor, and a more emotionally resonant one. Some longtime fans have bristled because the movie goes in directions considered blasphemous by the sort of people who have Chewbacca costumes in their closet. Less than heroic decisions by beloved characters, unexpected revelations about the parentage of new heroes, heretofore unrevealed powers of the Force… sorry I’m being so vague, but nature abhors a spoiler. For my money, those controversial choices make this a richer and more expansive work. Johnson is the first Star Wars director to color outside of the lines, and that’s exactly what this franchise needs as it seeks to capture a new generation. At two and a half hours, the film is a bit bloated, and John Boyega’s arc is simultaneously the most superfluous and the most under-served, but those nitpicks fall away in the wake of a visual masterpiece that keeps finding new ways to surprise. A year before the release of the “every superhero in one movie” Avengers: Infinity War, Marvel had a strong showing with a trio of light-hearted crowd-pleasers that succeed by not taking any of this stuff too seriously. 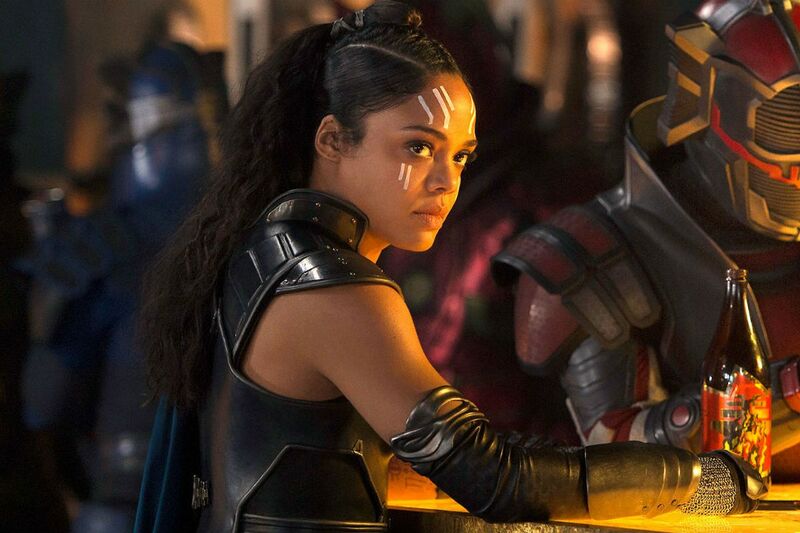 Best among them was Thor: Ragnarok (#6), which director Taika Waititi turned into an absurdist tour-de-force featuring splendid comic performances by Chris Hemsworth, Mark Ruffalo, Tessa Thompson and Jeff Goldblum. Guardians of the Galaxy Vol. 2 (#14) followed the lovable band of misfits on another adventure and upped the ante with the addition of geek film hero Kurt Russell. And nobody thought we were ready for another Spider-Man reboot, but Tom Holland proved the best (and most age-appropriate) webslinger yet, launching the character into the Avengers universe with Spider-Man: Homecoming (#17). Not every great 2017 superhero movie was a laugh riot. Logan (#15) took the X-Men franchise to a very dark place, following Hugh Jackman’s Wolverine into a future where mutants have been eradicated and his healing powers have begun to diminish (he even has to use reading glasses — I can relate). This hard-R exploration of mortality showed that the superhero genre can provide more than just escapism. Finally, one of the most unexpectedly powerful and moving trilogies came to an end with War for the Planet of the Apes (#19), in which the ape protagonists were as well-rounded as any human heroes. Andy Serkis will probably never get an acting nomination from the Oscars for his motion capture work but he certainly deserves one. This entry was posted in song of the day and tagged John Williams, The Last Jedi. Well, as we have discussed outside of this blog, I had more issues with Star Wars than you did. It was bloated by about 20-30 minutes in the middle with scenes (casino) and characters (Laura Dern’s) that felt unnecessary. Those flaws drop this film below I, II and V for me. And, though you covered it with your woman category, Wonder Woman deserves mention here as, in my opinion, the best superhero movie of the pack. I, II and V would be The Phantom Menace, Attack of the Clones and The Empire Strikes Back. I get Empire but I’m guessing (and hoping) you didn’t mean the other two! I would put IV and V ahead of The Last Jedi, but I think Return of the Jedi hasn’t aged as well, so I’d slot this one in at #3 overall. First Happy Birthday Alex ❤️ We tend not to like this genre. That said Wonder Woman is in my top ten and John Wick 2 is dead last. Loved the first one so thought a sequel would be good but it was so bad. I didn’t like Star Wars: The Last Jedi as much as The Force Awakens. However, that being said I think I enjoyed it more than my counter parts in my family and still think it was a worthy addition to the franchise. Guardians of the Galaxy Volume 2 was far superior to everything else you included in this post and I feel after a rewatching you too will find that it deserves a higher spot on your list. No other superhero movie carried quite the emotional weight that GOTG 2 did as well as was as clever beautifully shot. Honestly I could go on and on. Great movie.